Historians tell us that slavery was first introduced to the Western Hemisphere shortly after Columbus returned from his first voyage. It was Columbus, who told Queen Isabel and King Ferdinand that the best way to finance new colonies in the New World was by enslaving the Native Americans and selling them. It wouldn't take long before Spanish and Portuguese slavers (conquistadors) stripped most of Caribbean Islands, and Central America of their Native American indigenous population. Millions were sold to the highest bidder, and then shipped all over the world as needed. Much of the time they were forced to work in gold and silver mining mines where they worked until certain death. After the indigenous workforce was wiped out there became a need for more laborers in North and South America. Slavery had occurred in Africa for hundreds of years prior to the discoveries of Christopher Columbus in the New World. The majority of slaves were usually captured during wars between the numerous African states. One of these states, which was called Dahomey, specialized in capturing young men and women and then taking them to the coast where they could be sold to a slave ship. At this time, the majority of the African slaves were sold into the Muslim world. The African slave trade did not start in Britain until 1562 when Captain John Hawkins raided Sierra Leone and captured 300 Africans. Hawkins sold them to the Spanish colonies in the Americas. Before long, others were in the lucrative business which at the time was largely financed by London money and approved by royalty. By 1700, British ships would account for 1.6 million of the Africans who were sent as slaves to the New World. At the time a typical slave ship held between 200-300 slaves, and each slave was normally allotted 10 square feet of space making the traveling conditions horrible. Ships lacked basic sanitation, and dysentery ran rampant. Approximately, 30% died on each voyage. On occasion, ships that were running out of water, solved the problem by throwing slaves overboard. In all, over 2 million Africans were exported to the various British Colonies. The sugar plantation of England's West Indies was a common destination for African slaves. Jamaica alone purchased over 600,000 slaves for work on their plantations. Profits of 200% on a voyage were common, and before long New England merchants and sea captains also began participating in the trade. 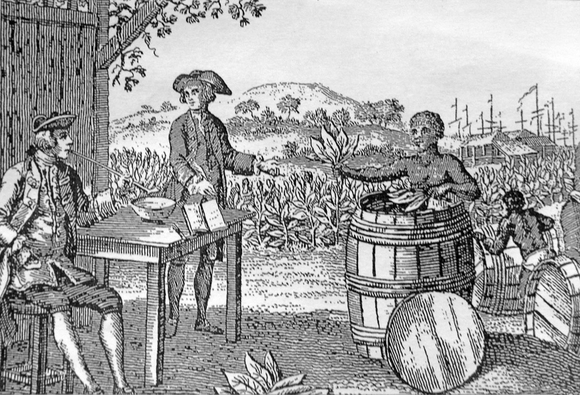 Virginia would receive its first African slaves in 1619. However, at the time there were many more white indentured servants than there were slaves. Most of the indentured servants were working to pay off the money they had borrowed for passage to the New World. By 1680, the supply of indentured servants began to die out and the owners of the plantations quickly turned to Africa for their manpower. By 1759, so many African slaves had been imported that in some parts of the South the population of blacks and whites were equal. Virginia and Maryland especially used intensive African slave labor because their agriculturally based economies were producing an amazing 220 million pounds of tobacco a year. Historical research tells us that during the 400 years of slavery, 11,700,000 Africans were exported to North and South America.